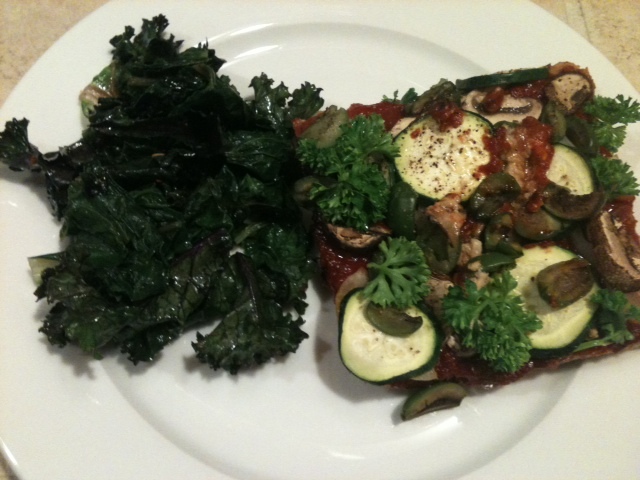 Nope, this ain’t no pizza yo … it’s paleo MEATza! The entire crust consists of ground meat, then it’s topped with pizza sauce and veggies, just like a standard pizza, but minus the cheese. It’s delicious, easy and yields great leftovers. The combinations are endless too. Jesse and I like to eat our meatza with either steamed broccoli or sauteed greens. Tonight, it was chard and kale sauteed in coconut oil with garlic, salt, pepper and red pepper flakes. It would be great eaten alongside or on top of salad too. Combine the meat and eggs in a bowl and mix well. Add spices to the meat/egg mixture and mix thoroughly. Put meat mixture into a 9 x 11 or 9 x 13 pan at pat down evenly. 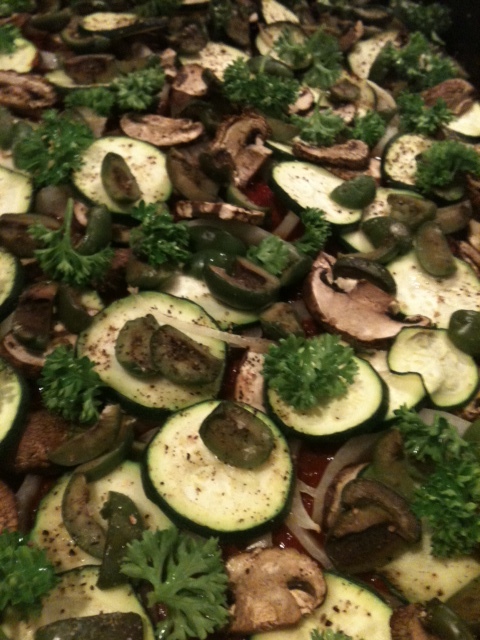 While the meat crust is baking, mix all the sauce ingredients together in a bowl and chop the veggies. Feel free to add other spices you like to the sauce and use whatever veggie toppings you like. When meat is done baking, pull pan out of the oven and top with sauce and veggies. Put back in the oven for 5 minutes at 350 degrees. Then, turn your broiler on at 450 degrees and cook for another 7-10 minutes. Garnish with fresh parsley, if using. This looks really good! My fiance has been craving pizza for some time (we’re both paleo) and she just read about your “meatza.” We’re going to try it! It IS really good, Karl! I’m glad to hear you and your fiance are going to try making it. Let me know how you like it! I LOVE meatza! I often make it as a quick and easy meal on a Friday if we’re having a dvd night. Even my husband who isn’t eating paleo loves it and prefers it over regular pizza (although he has cheese on his meatza). Yep, meatza is pretty awesome! I think anyone who’s a meat eater, Paleo or not, would enjoy meatza. You really can’t go wrong! Yum … I can tell I am gonna like being friends with YOU! hahahha!